Can Precision Drilling maintain the near-term uptrend? Reference the last chart analysis for Precision Drilling. webcast to begin promptly at 12:00 Noon MT (2:00 p.m. ET) on the same day. Update Friday, Oct 21, 2011: Stock sold-off to the $11.00 level as indicated by a bearish engulfing pattern on the daily chart: sold into the news of the earnings release. Traders who bought the stock at the beginning of the month took profits on the gain from $8.00 to $12.00: a nice profit of 50%. Update Monday, Oct 24, 2011: Precision Drilling closed at $11.87 today. The stock pattern may indicate that it will ease into a lateral band between $11.00 and $12.00. A close above the $12.00 resistance level for two days would be a sign to add to long positions with an intermediate target of $15.00. If the stock cannot hold the $11.00 level, it would be a sign to liquidate longs. Update Monday, Oct 31, 2011: Precision Drilling closed at $11.56 today. A tall bearish candlestick (daily candlestick chart) after two spinning tops is not a good omen. Another negative factor is the above average volume today on the sell-off. 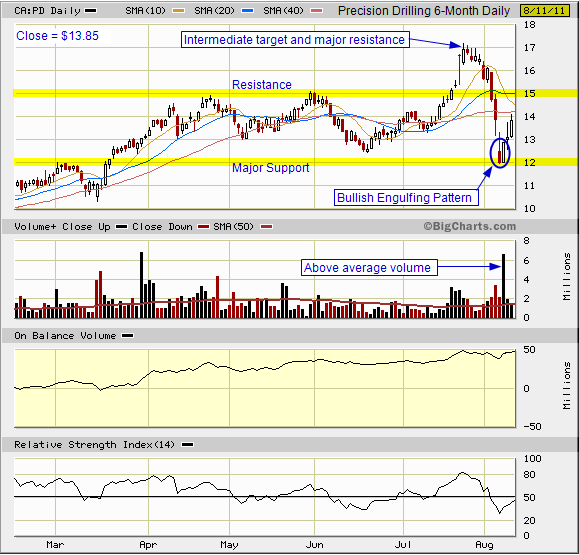 If the stock cannot hold support at $11.00, the next major test would be the 50% retracement level of around $10.00. This entry was posted in Stocks and tagged near-term trend, Precision Drilling, resistance, support on October 12, 2011 by Trader. 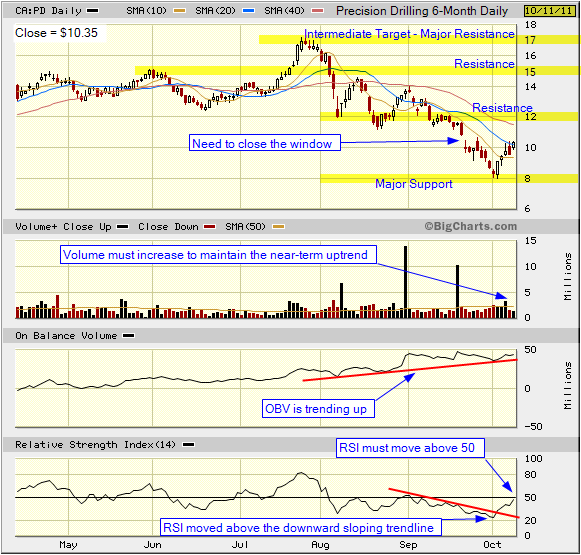 You can see from the chart that the $12.00 level provided support in the recent sell-off. The bullish engulfing candlestick pattern confirmed the bottom with above-average volume. You now have a stop-loss point at the major support level of $12.00 and you have near-term and intermediate targets. 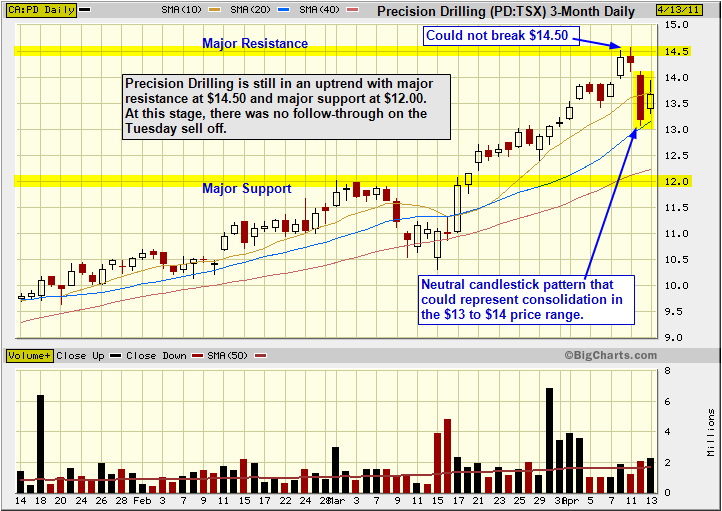 Precision Drilling is a stock that can be traded and is in a near-term uptrend. Reference the previous analysis for Precision Drilling. This entry was posted in Stocks and tagged Bullish Engulfing Pattern, Precision Drilling, volume on August 12, 2011 by Trader. Precision Drilling Corporation 2011 Second Quarter Results Conference Call and Webcast. This entry was posted in Stocks and tagged Bullish Candlestick, MACD, OBV, Precision Drilling on July 21, 2011 by Trader. Can Precision Drilling break resistance at $15.00? Reference the last analysis for Precision Drilling. This entry was posted in Stocks and tagged candlestick, MACD, Precision Drilling on June 1, 2011 by Trader. The chart is still in a uptrend. There was no follow-through on the Tuesday sell-off. 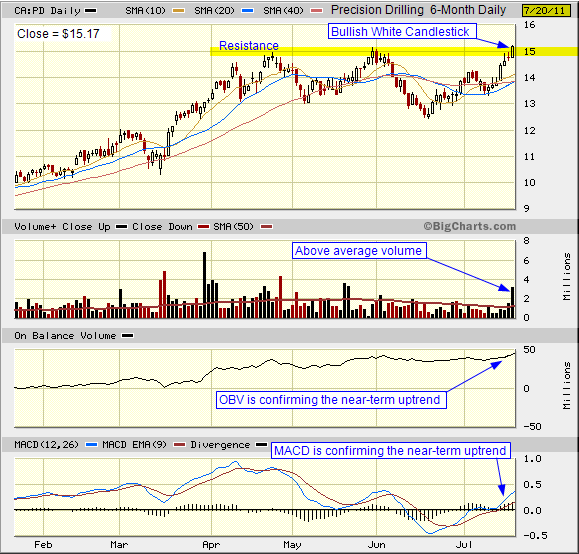 Major resistance on this candlestick chart is $14.50. Major support on the chart is $12.00. You should maintain a neutral trading strategy at this stage with alerts at $14.00 and $13.00. 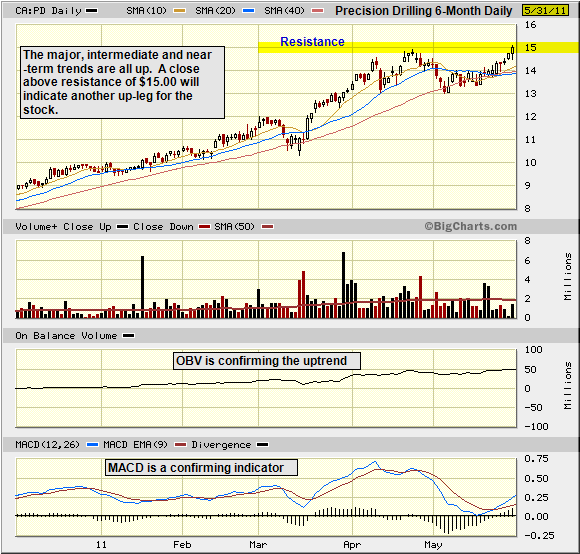 A close above $14.00 will indicate a possible attempt to break resistance at $14.50. You could add to long positions with a close above $14.50 but this depends on the volume and other indicators at the time of the break. A close below $13.00 would indicate a possible test of support at $12.00. You would liquidate long positions if the stock closed below $12.00 with the next support test at $10.50. You can reference the previous chart analysis for Precision Drilling. Also visit the company website for fundamental data. Reference BigChart.com for the most recent one year daily chart. 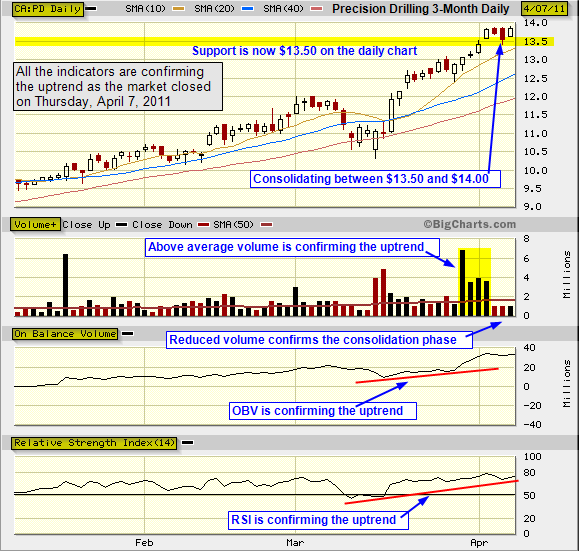 Update for April 20, 2011: RBC raises Precision Drilling Corp price target to C$16 from C$12.50; rating outperform. This entry was posted in Stocks and tagged candlestick charts, moving average, Precision Drilling, resistance, support on April 14, 2011 by Trader. 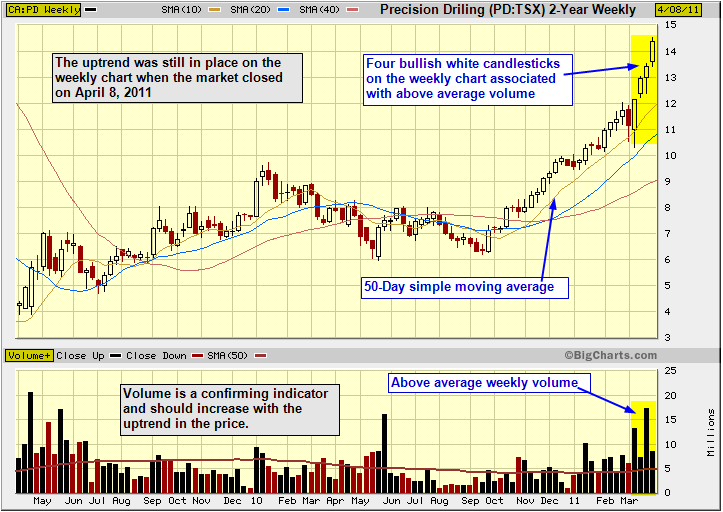 Reference the previous weekly chart for Precision Drilling. Also reference the chart analysis based on the daily candlestick chart. The important point from this chart is that the stock is in an uptrend and you always trade in the direction of the trend. But, Precision Drilling is a little overextended as indicated by the height above the 50-day moving average so we could see a correction to support at $13.50. If the stock broke $13.50, the next minor support level would be $13.00. Major support is at $12.00 which is near the the 50-day moving simple moving average. This entry was posted in Stocks and tagged candlestick charts, Precision Drilling, volume on April 12, 2011 by Trader. 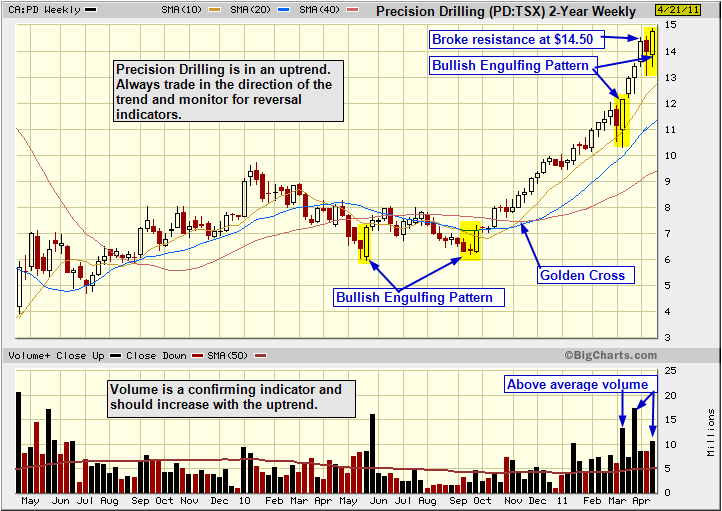 Reference the previous post of the weekly chart for Precision Drilling. 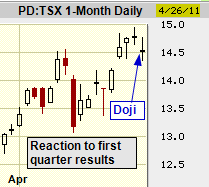 Input the advanced chart settings for BigCharts.com and view the current daily chart for Precision Drilling (PD:TSX). This entry was posted in Stocks and tagged candlestick charts, OBV, Precision Drilling, Technical Analysis on April 8, 2011 by Trader.